Many of the books I share here are books that I grew up with. There is something special about books from your childhood. Varenka by Bernadette was one of my favourites. I tried to find out more about Bernadette – I have several of her books – but her surname is not mentioned anywhere. Edit: Bernadette is, of course, Bernadette Watts and here is a link to her site. 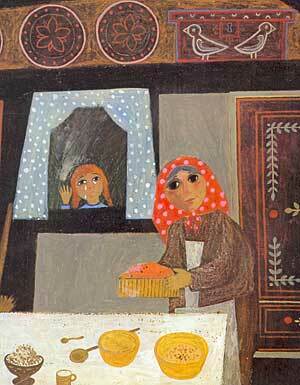 Varenka is not a re-telling of a Russian folk tale as I previously stated, but written by Bernadette herself. Each picture fills the entire page, so I was forced to reproduce mostly cropped details here. Which really does not convey the beauty of the book. But all is not well in Varenka’s world. A great war rages in the west and she meets many refugees warning her to flee with them, because the soldiers were drawing nearer each day. She locked herself up inside her little wooden house and prayed, asking that God should build a wall around her house so that the soldiers wont see her. Day after day, she hears the cannons get louder in the distance. She meets more people who are fleeing from the soldiers – they have nowhere to go because the soldiers burnt their houses down, and killed their families. 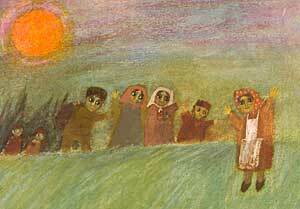 They are an old man called Pieter, an artist called Stefan, and a little girl called Belia. 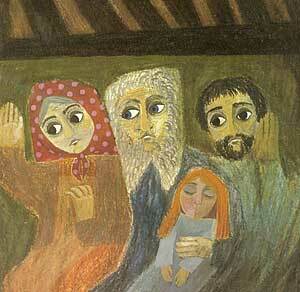 They shelter with Varenka in her little house. 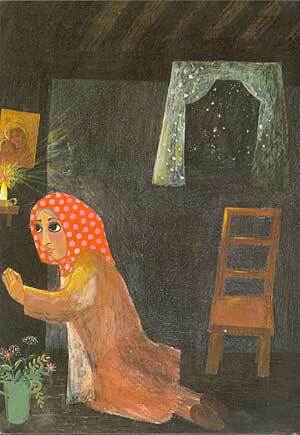 Every night the cannons grow louder, and Varenka prays that God should build a wall to hide her and her friends. But every night, God does not build a wall. Until one morning she wakes up and finds everything covered in a thick blanket of snow. 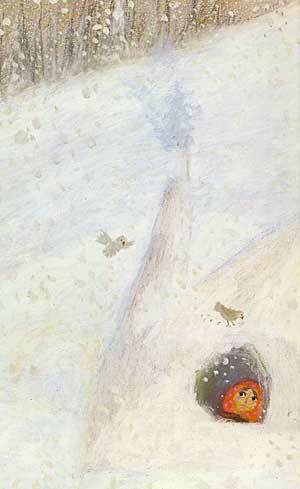 But the soldiers never notice Varenka’s house behind it’s wall of snow. The war moves away from that part of Russia, and soon enough, it was springtime. Note: Varenka is Copyright NordSud Verlag, Monchaltorf, Switserland. The Afrikaans edition that I own, is Copyright Tafelberg Uitgewers, Kaapstad and Johannesburg. Previous Genre Covers Next Bravemouse is here! I’m sure that, somewhere in this house, we still have a copy of Varenka… I too liked it, though nowhere near as much as it sounds you do. ^-^ ’tis good to see books so well loved. 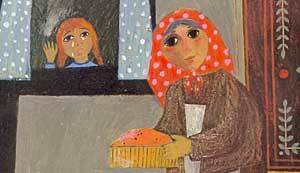 I love the story of Varenka as i was ‘Varenka’ in the primary school play over 30 years ago. 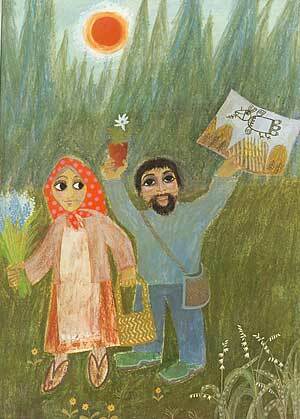 I also called my little girl Varenka-we often read the story and have copies of the book in two different languages. It is very nice to know you enjoyed Varenka so much. 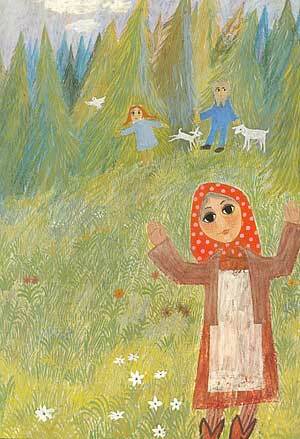 But I would point out it is not a retelling of a russian folkstory, it was my own story and the name Varenka was invented – although I now know 2 little girls with that name. Dear Bernadette Thank you for your comment – and for the information. I will correct the mistakes re the “folktale” – I did quite a bit of research online and could find no anything about the origin of this story when I was writing this post. About the illustrations – would you like me to take them down? Since publishing the post, I found your website, but at the time I could not find any contact details for you. I love Varenka! It was one of my favourite childhood books and I loved it so much I bought a copy as an adult. I think I loved it so much back then that I am helpless to do anything but love it now. True 🙂 It is such a magical, snowy book. 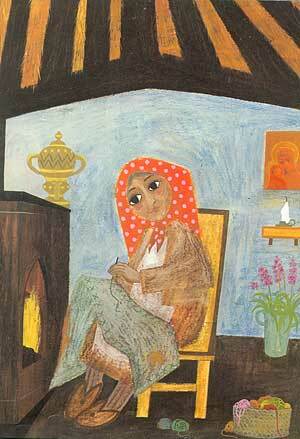 It may be cold outside but it’s safe and cozy in Varenka’s house. Thanks for your comment. Nice to see comments still coming along and people still like this book.I think I was about 25 years old when I made this book. I am now 70. And it is still in print. Emma Briggs and her daughter Varenka Briggs have become good friends to me. 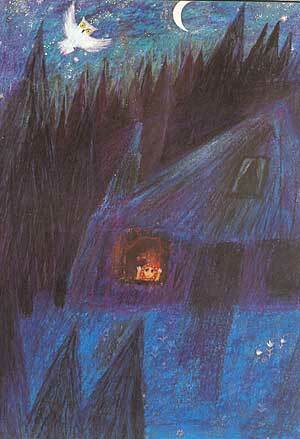 Going to Zurich tomorrow to celebrate exhibition og Grimms Fairy Tales. Please look at my new animated website made by my cousin Alice Priestley – born same day as myself, also a children illustrator. Glad to hear from you again, Bernadette 🙂 I’m sure you will have a wonderful trip, thanks for letting me know about the new website – I’ll look it up now. This past summer I picked up a hardcover copy of Varenka at a garage sale. I have a home daycare and love to find new books for the children. Just today I finally read it and it is a beautiful story so I don’t wonder why you love it so. I’m glad you posted Bernadette’s website as I will follow it and will always look for other books written by her. That’s great, Bernadine 🙂 I’m glad you found it, and thanks for the comment. 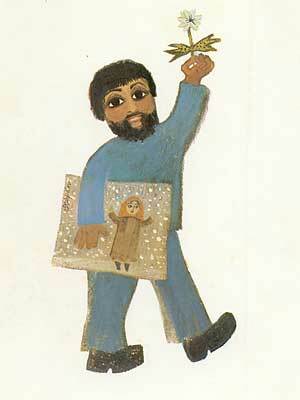 Almost 50 years ago I was reading this book to a three year old at her house, i found it on her bookshelf. About half way through the book I began to feel uncomfortable because I knew that God was not going to build a wall to hide the people. I was trying to decide what I would tell a young child about how God works. 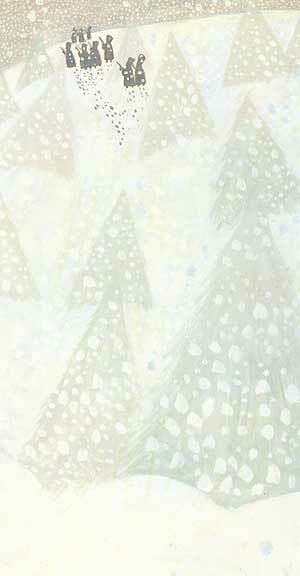 I was completely surprised and delighted when I turned the page and saw the snow. Even today I can still feel my genuine joy at seeing that picture. I never forgot the story although I have never seen the book again. Now that i know it’s available I will buy it and treasure it. Thanks for dredging up this wonderful memory. So glad, Josephine 🙂 I remember feeling the same thing, the relief when you see how the story resolves.